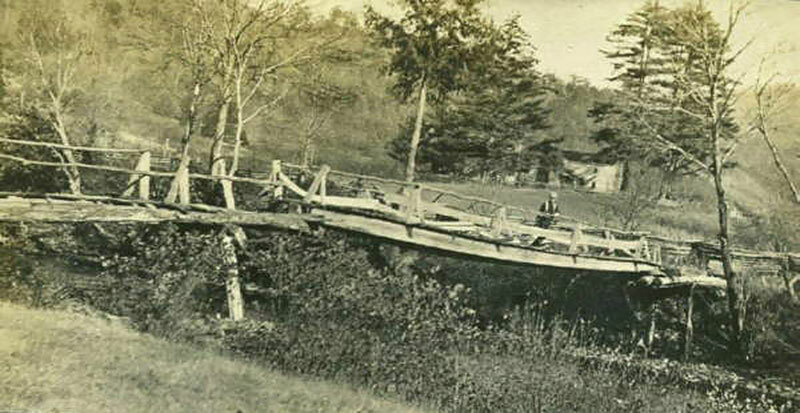 Cantilever bridge across the Nantahala River — Photo by George Spencer, an engineer for Alcoa who took many pictures of Aquone while guaging streams in the Aquone area around 1912. 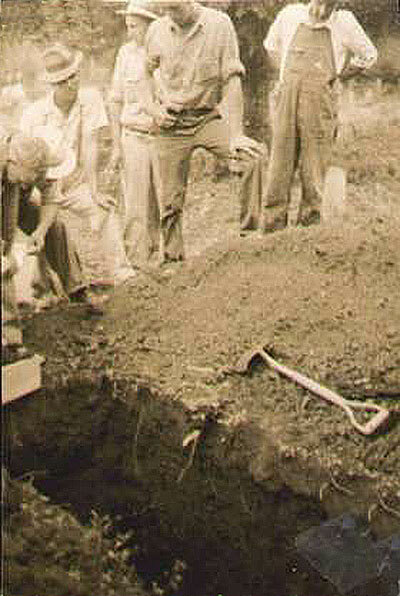 They were looking for potential dam sites for the production of electricity for the Alcoa plant in Tennessee. For more of Spencer's images visit NantahalaNC.com. The Cherokee lived in the area exclusively for nearly 4,000 years, until European traders followed Indian paths to Western North Carolina. In 1838, when the Indians were being rounded up for the Trail of Tears removal to Oklahoma, they were detained at Camp Scott (now covered by the Lake), near the mouth of Wine Spring Creek. Then they were walked at gunpoint over the mountain to Valleytown – present day Andrews – where they joined thousands of other Cherokees in preparation for the long trek west. By the time the Civil War started there were several well-established communities of white settlers living on small farms. Like other parts of the Southern Appalachians, almost all were of Scots-Irish descent; the topography and remoteness reminded them of home. Small communities with names like Little Choga, Aquone (Cherokee: "by the river"), Otter Creek, Beechertown, Camp Branch and Briartown flourished with schools, churches, stores, lumber and corn mills. The area has always been secluded, and in the early days of travel was unreachable without steep, rutted mountain roads, swinging bridges, and stream or river fordings. The mail was delivered by horseback, and there was no electricity until the late 1940s and no telephones until the 1950s. 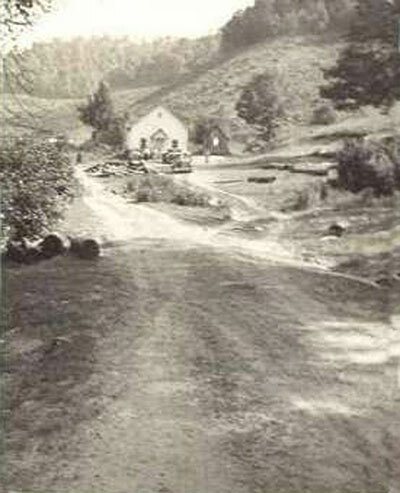 Moving a cemetary prior to Aquone being flooded by the new lake in 1942. In 1929, Nantahala Power and Light Company was organized as part of the nation's rural electrification program; the abundance of water in the region was ideal for hydroelectric power generation. Nantahala Dam was finished in 1942 creating the lake (reservoir) that was critical to the success of defense projects for World War II. The dam and its feeder pipes allow the control of water not only for power usage, but also to manipulate water during natural disasters and to provide recreational activities. National Forest. The area is also home to the Wayah District of the Nantahala National Forest, established in 1920, and containg 133,894 acres. Well-known areas include the Nantahala Gorge, Wayah Bald, and the Joyce Kilmer-Slickrock Wilderness. Thanks to Jim and Faye Wood and their website NantahalaNC.com for much of the information and all the photographs. During the early 1970s, Lake Nantahala was the official training ground for the Army Green Beret and Special Forces. They set up camp at Appletree Campground just down the road and a communications headquarters on top of Wayah Bald, the highest point in the area at 5,400' above sea level. Most days, the soldiers flew to the Diner in Chinook and Huey helicopters for lunch. They landed in the grass right next to the Diner, which provided much excitement for the local kids and fellow diners. Many of the soldiers passed out MRE's, Army issue can openers, fatigue patches and other things the kids loved to get their hands on. In the early morning hours, the soldiers could be seen out on the lake practicing "Scout Swimming," which is a method of swimming that leaves only the head above water and leaves no wake. In the afternoons, the fighters and bombers would dive bomb the dam, which was their target for practice strafing and bombing runs. Looking at present day Nantahala, it's hard to envision what the area looked like before Nantahala Lake was created in 1942. Much less tens of thousands of years earlier when Cherokee (or perhaps another people prior to the Cherokee) made their home here. Much broken pottery, broken spearheads, arrowheads and other artifacts have been found in all areas of the Nantahala Community providing evidence of Native American villages on flat ground near streams and in many small high mountain valleys.